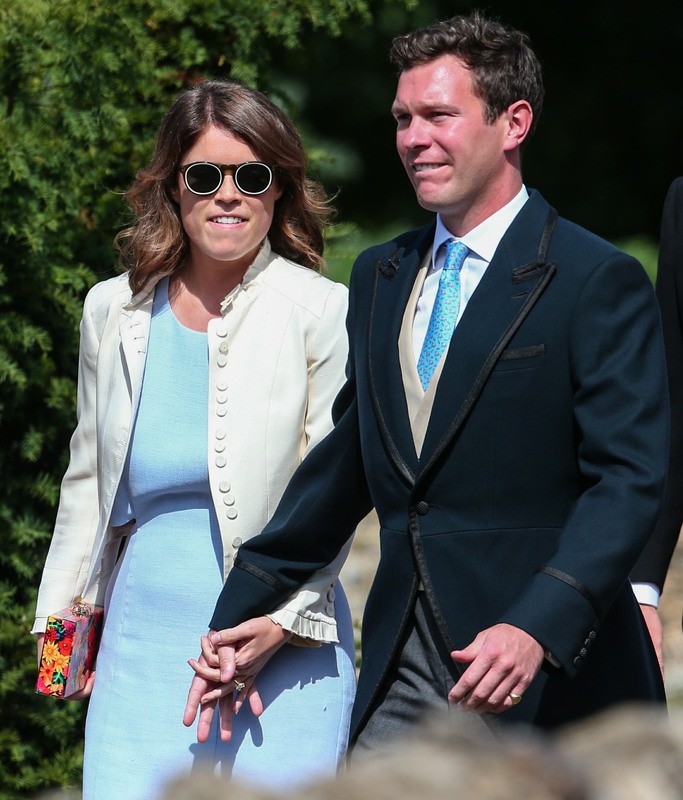 Here are some photos of Princess Eugenie of York and Jack Brooksbank at the wedding of Charlie Van Straubenzee and Daisy Jenks, the same wedding that Prince Harry and Meghan attended on Meg’s birthday. I just never got around to posting these photos, so enjoy. I’m sad to see that Eugenie’s wedding-guest attire game peaked years ago, at William and Kate’s wedding. She looks like a middle-America secretary! Anyway, last month the Daily Mail reported that Jack Brooksbank was not going to ask for a title, and one would not be offered to him. He’s fine being Normal Jack, Duke of Nothing, and Eugenie is fine with it too. There were some differing opinions about whether it was even possible that the Queen would have offered him a title. My take? I think the Queen probably would have been more than willing to offer Jack some minor title, like a viscount or a marquess, but only if Jack had wanted one and only if Prince Andrew had really pressed his mom about it. My take is that Eugenie wanted to avoid the drama and that Jack actually is fine without a title. Well, here’s a confirmation of that: People Magazine says there’s no title, and that Eugenie will still be a princess. Princess Eugenie and fiancé Jack Brooksbank will be getting the royal treatment at their Oct. 12 wedding at Windsor Castle — but will the new member of the family receive a royal title? Queen Elizabeth handed her grandson, Prince Harry, a dukedom on his wedding day to Meghan Markle in May, officially making them the Duke and Duchess of Sussex. However, Jack will not be receiving a royal title — he’ll simply be known as “Mr. Brooksbank.” According to the BBC, Eugenie “will keep her royal title when she marries Mr. Brooksbank,” but she will have the “option” to take his last name. Despite appearing alongside her family at royal events and supporting charitable causes, Eugenie works as a director at the London art gallery, Hauser & Wirth. The 28-year-old is “is throwing herself into it,” an insider recently told PEOPLE of her job. To take a title or to not take a title? I imagine for a lot of men, it’s quite a quandary, especially when your blood-princess wife is still going to go by her de facto maiden name, which involves an HRH. They’ll be known as HRH Princess Eugenie of York and Mr. Brooksbank… and they’ll live in royal accommodations, and they’ll do some royal work while they’re both holding down regular-person jobs. This is either “modern royalty” or it’s a mess. You choose! I find I do have some begrudging respect for Jack though – it must be tempting, the idea that he could suddenly insist that he really does need a title.